BRISBANE, Australia—Annette Lu, a former vice president of Taiwan, the Republic of China, is no stranger to conflict and the games governments play. She could guess but was a little puzzled by the recent delay in being granted a visa to visit Taiwanese communities in Australia during April. Her visit coincided with Prime Minister, Malcolm Turnbull’s trade trip to China and it left her wondering whether Australia is becoming too much under the influence of the Chinese Communist Party. The Communist State in China refuses to recognize Taiwan as an independent state, claiming it instead as part of the mainland. 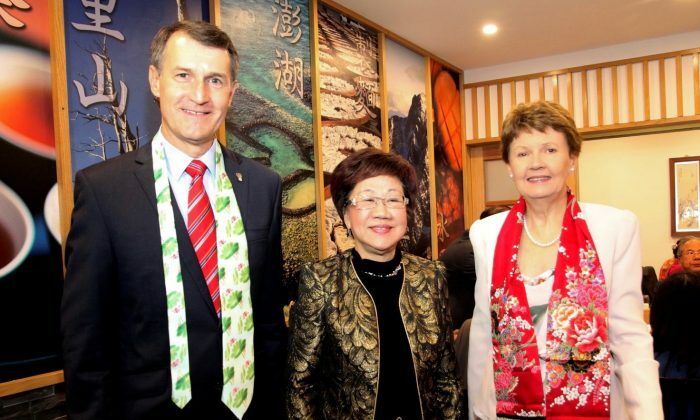 On the evening of April 16, she spoke briefly at a friendship dinner in her honor attended by Brisbane’s Lord Mayor Graham Quirk and his wife, state and federal elected officials and other Western and Taiwanese business leaders. Likening China to a lion in the jungle and Taiwan as more like a “kitty cat,” Ms. Lu commended Australia for taking so many immigrants from Taiwan but warned against being played for a pawn. She also expressed concern that the delay in her visa approval, timed for after Turnbull’s China trip, was to appease a trade partner. On his first visit to China as Prime Minister, Mr. Turnbull was feted by the Chinese leadership, meeting his counterpart Li Keqiang, and attending a private dinner with China’s President Xi Jinping, the ABC reported. Annette Lu [Lu Hsiu-lien] with some of the dinner guests at a Taiwanese restaurant in south Brisbane on April 16, 2016. Front row: (L–R) Annette Lu and Senator Claire Mary Moore. Back row: Duncan Pegg (1st L), state member for Moreton; Professor Chwei-Liang Chiou (3rd L); and Ken Lai (1st R), director-general Taipei Economic and Cultural Office Brisbane. Ms. Lu’s trip to Australia was organized by Associate Professor Chwei-Liang Chiou, from the School of Political Science and International Studies at the University of Queensland. Dr. Chiou requested a visa at the beginning of the year expecting Ms. Lu to visit early in April but her visa was held up, approval delayed until later in April and after Turnbull’s trade trip. A graduate of National Taiwan University, the University of Illinois, and Harvard Law School, Annette Lu [Lu Hsiu-lien] has had an active political career in her native Taiwan, pursuing gender equality, human rights, political reform, Taiwan independence, and environmental protection. In 1980 she was tortured for her efforts, then charged with sedition after leading a demonstration on Human Rights Day. As a result she served over 5 years in prison. Undaunted Ms. Lu maintained her views and twenty years later she was voted in as vice president of Taiwan, remaining from 2000 to 2008. Currently president of Green 21 Taiwan Alliance, Ms. Lu was in Australia to share her experience and her views with Taiwanese Australians. Ms. Lu likened herself to a “pioneer for women’s success” stating that with females promoting “love, justice and peace,” and more women in all areas of politics, she believed tomorrow would be a better place.